Russell Falls is arguably Tasmania’s most breathtaking waterfall and is certainly the most photographed one. I visited Russell Falls on my recent trip to Tasmania and can say I was very impressed by the waterfall and the surrounding national park. This article will tell you everything you need to know about visiting Russell Falls in Tasmania. 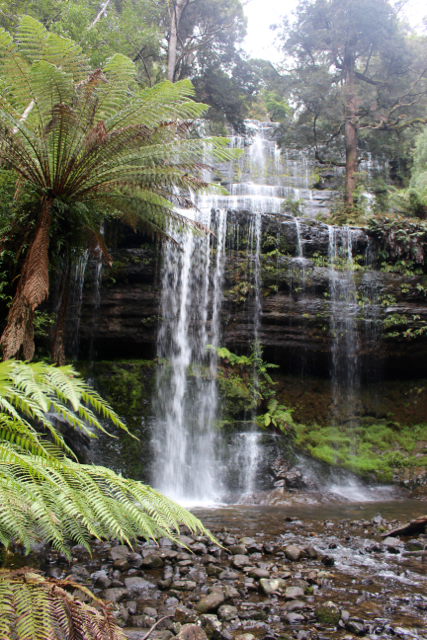 Russell Falls is located within Mount Field National Park, just 1 hour out of Hobart. The drive from Hobart to Russell Falls passes through the beautiful Derwent Valley following the Derwent River for most of the way. You will find the trailhead to Russell Falls at the Mount Field National Park visitor centre, which is pinpointed on the map below. From the Mount Field National park visitor centre, the trail to Russell Falls takes 10-15 minutes one way. The Russell Falls trail is mostly flat and suitable for everyone, including those with prams and wheelchairs. Ferns line the tracks edge with giant eucalyptus and myrtles towering overhead. The trail leads to a viewing platform at the base of the falls. You can return the way you came or you can follow the creek back after crossing the bridge below the falls. The trail to Russell Falls is busy and has lots of signage so it is impossible to get lost. 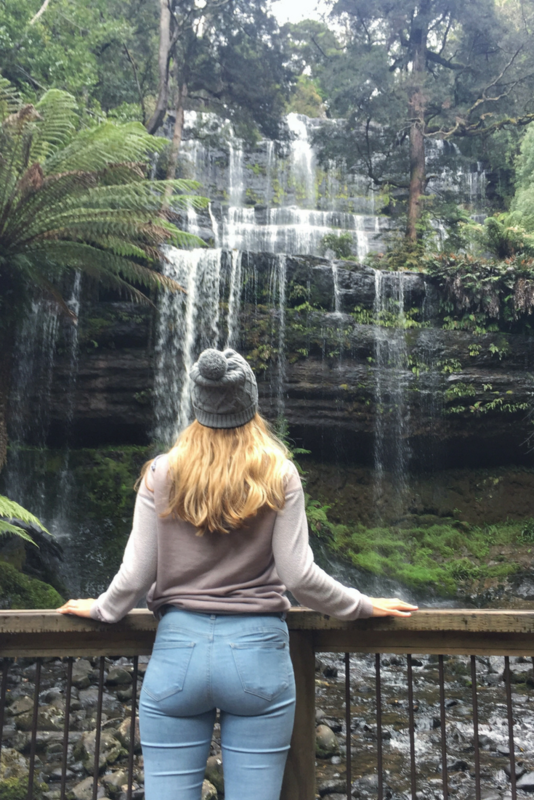 From the viewing platform at the base of Russell falls, you can admire the spectacular waterfall, which is the centrepiece of Mount Field National Park. The waterfall has two main drops and is as wide as the eyes can see. The length (sideways) of the waterfall is what makes it so unique. Russell Falls is part of Mount Field National Park. There are two more waterfalls in Mount Field National Park, Horseshoe Falls and Lady Barron Falls. Instead of turning back at Russell Falls you can continue and follow the loop past all three falls and back to the visitor centre. See my full guide to Mount Field National Park here. At the Mount Field visitor centre where the trail to Russell Falls starts, you will find a day use area and camping area. For those camping around Tasmania, why not spend the night and explore the falls by night. Rumour has it that the falls are home to glow worms. The camping facilities include toilets, electric barbecues, a kiosk and the visitor centre. Cabins are also available just outside the park. 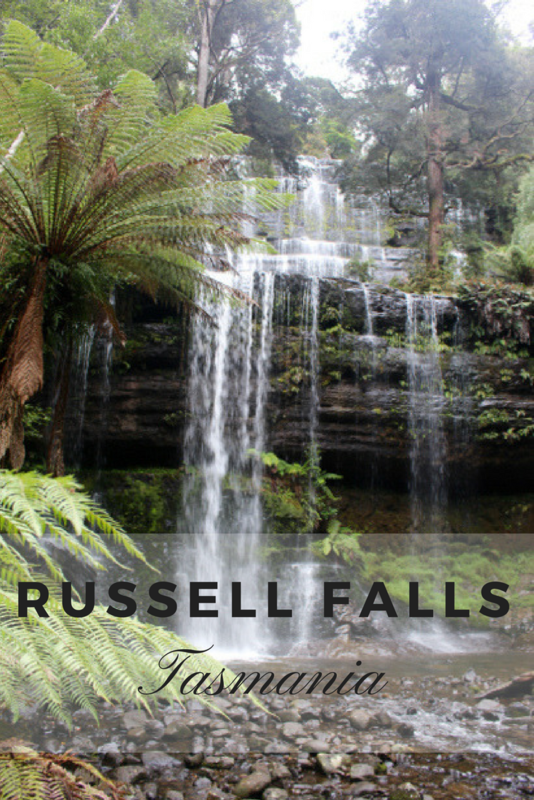 If you don’t have a car but want to explore Russell Falls from Hobart, why not take a tour. You can book a tour from Hobart to Russell Falls here. This tour includes a scenic drive through the Derwent Valley and Derwent River, Mount Field National Park and Russell Falls, a visit to the oldest trout hatchery in the Southern hemisphere where you can feed trout and salmon and can include a salmon lunch and a glass of wine if you like. Book here. If you take rubbish with you to Russell Falls, take it home with you. Snakes are known to the area so keep an eye on the ground. Russell Falls is a very busy hike, so I recommend doing it early in the day to beat the crowds. Don’t forget to check out my guide to Mount Field National Park which provides information on all the hiking trails in the area.